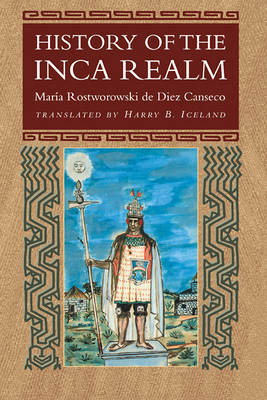 History of the Inca Realm, by Maria Rostworowski de Diez Canseco, is a classic work of ethnohistorical research which has been both influential and provocative in the field of Andean prehistory. Rostworowski uses a great variety of published and unpublished documents and secondary works by Latin American, North American, and European scholars in fields including history, ethnology, archaeology, and ecology, to examine topics such as the mythical origins of the Incas, the expansion of the Inca state, the organization of Inca society, including the political role of women, the vast trading networks of the coastal merchants, and the causes of the disintegration of the Inca state in the face of a small force of Spaniards. At each step, Dr Rostworowski presents her own views, clearly and forcefully, along with those of other scholars, providing her readers with varied evidence from which to draw their own conclusions.